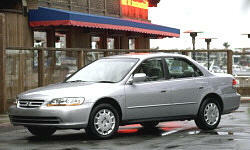 Why the 2002 Honda Accord? In 2001, I bought a fully-equipped Honda Accord Coupe brand new for less than $21,000. As a 30 year old with no tickets, insurance is very cheap, even with a red, 2 door, V6 engine. Why Not the 2002 Honda Accord? The transmission has failed TWICE for me. Also, V6 engine, while smooth, is lacking in HP and Torque. The Accord has acceptable road noise, but as it ages, it has numerous shakes and rattles. I bought the car so I could drive it, change the oil, and keep driving it. But from faulty fog lights, worn radio controls, two transmissions, two alternators, and numerous rattles, I have not reached my goal of maintenance-free driving and quality. Honda dealers attempt to overcharge for everything. $25 for a light bulb? YOu gotta be kidding me.